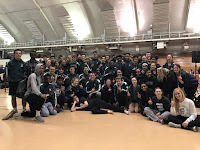 Cool temperatures returned Friday night but with no wind or rain the weather remained nice for a Wisconsin spring track & field meet. Coming off a second place finish at the City Championships our varsity kids went out and competed against 20 of the best teams in the state at the Monona Grove Invite. Our kids competed at a very high level and finished in 2nd place Friday night scoring 85 points. We continue to set PRs and improve going into next weeks Conference Meet. As a coaching staff we are really excited about what this years team can accomplish at Tuesday's Big Eight Conference Meet. The team was led Friday night by Daurice F who won the 110m hurdles (14.86), 300m hurdles (40.53), long jump (20' 6.25"), and was a member of the 2nd place 4x400m relay (3:29.95). Daurice was joined as a multi-event winner by Jester W who won the 100m dash (10.79), 200m dash (22.48), and was a member of the 4x400m relay. Joining Daurice and Jester were Nick M and Josh P. Nick and Josh joined Tyler M and Sam B in the 4x800 to place in 4th place (8:18.54). On their own Nick M took 3rd in the 300m hurdles (40.91) and Josh P took 5th in the 800m run (1:59.28). Also, scoring points for the team with their top 8 finishes were: Ryan B in the discus with a 4th place throw of 144' 1", Jonah W in the 3200m run finishing 5th in 9:32.13, and James A in the 1600m run finishing 6th in 4:41.70. Next week will bring an end to the season for our JV and some Varsity kids. It is important we get quality rest this weekend. Take care of our body and our health and be prepared to compete at our best during our conference competitions next week. Things are really coming together nicely and we look forward to ending the season on a high note.